Simulating scenarios that involve aircraft, drones, etc. require modeling of movement in three dimensions. In this showcase, we show how such spatial movement can be produced and visualized with INET. In INET, mobility is added to nodes in the form of modules that represent mobility models. A large number of mobility models have been provided with INET, and they can also be combined. This showcase demonstrates producing movement in three dimensions. One way to generate spatial movement is to use mobility models that support it out of the box, for example LinearMobility, RandomWaypointMobility, MassMobility, TurtleMobility or BonnMotionMobility. Spatial movement can also be produced using superposition of several mobility models (where at least one of them must support movement in the Z axis). We show an example for both approaches. In these example simulations, we’ll make use of 3D visualization based on OpenSceneGraph (OSG). To try these examples yourself, make sure that your OMNeT++ installation has been compiled with OSG support. If it is not, you won’t be able to switch to 3D view using globe icon on the Qtenv toolbar. The simulations use the MobilityShowcase3D network. It contains a configurable number of mobile nodes (hosts) and an IntegratedVisualizer module. 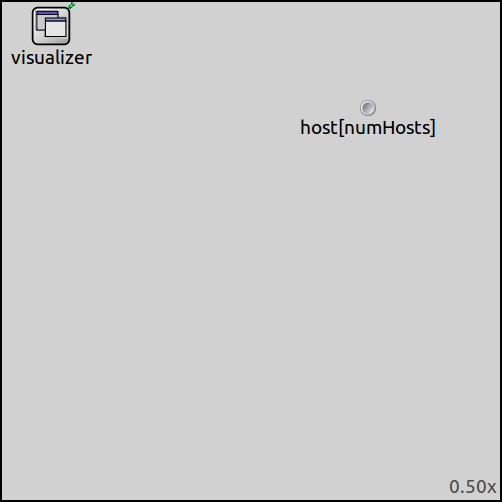 By default, IntegratedVisualizer only contains an IntegratedCanvasVisualizer as submodule, but no OSG visualizer. To add it, we need to set the osgVisualizer submodule type to IntegratedOsgVisualizer. We use the desert image as ground, and set the background color (clearColor) set to skyblue. The coordinate axes can be displayed by setting the axisLength parameter. Additional settings (not shown above) stretch the rendered scene a little larger than the constraint area of the mobility models to enhance visual appearance. Further settings enable various effects in the mobility visualization. Note however, that at the time of writing, not all features are implemented in MobilityOsgVisualizer (practically, only trail visualization is). The first example simulation is run using only one host. The 3D model of the host can be set with the osgModel parameter. In this example we use glider.osgb. For better visibility, the glider is scaled up to 100 times of its original size. It is also rotated by 180 degrees so that it faces forward as it moves. The MassMobility model is used in the drones in order to achieve a lifelike motion. The speed of drones is updated at every change interval, but more importantly, they also turn by a random but small angle. The change angle is nearly parallel to the XY plane, but not quite: there is a random inclination denoted by the rotationAxisAngle parameter, which will cause the drones to ramble in three dimensions. Use this page in the GitHub issue tracker for commenting on this showcase.